Not only featuring a fantastic hook-up rate, but also with a wire guard finely balanced to protect against snags in the water. Its head is bullet shaped to prevent snagging. The careful placement of the line eye lets the jig fall almost directly down, to prevent the worm from drifting away from the target zone. Equipped with a sturdy shaft it has all the needed power to pull the target rockfish up from the ocean floor! 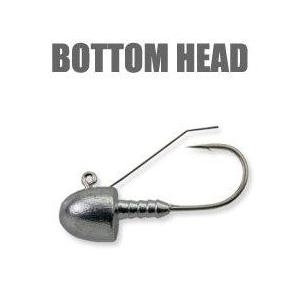 A must have jig head for rock areas and heavy weeds.